Three people were hospitalized Friday, Jan. 18, after a crash on Salamo Road involving two vehicles and a suspected drunk driver. The crash took place on the hillside portion of Salamo that runs toward 10th Street and Blankenship Road. According to West Linn Police spokesperson Jeff Halverson, the incident was reported around 3:20 p.m. 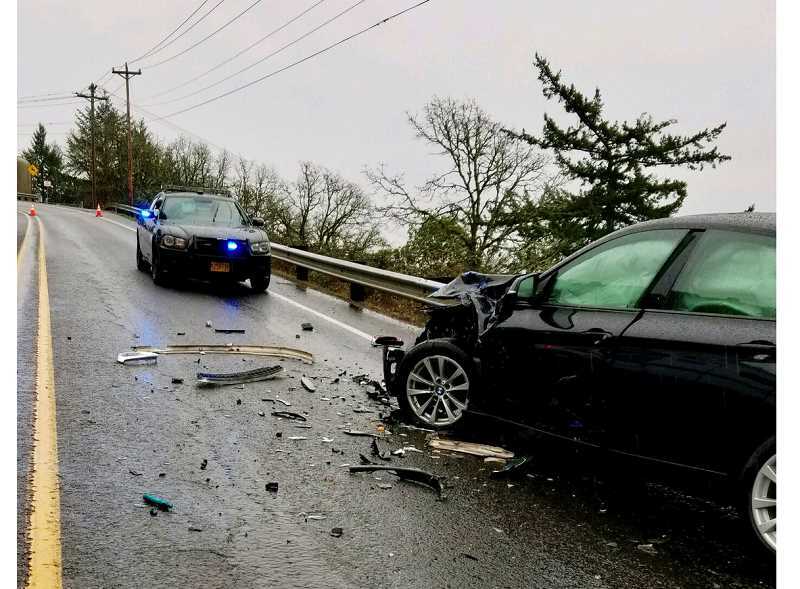 The DUII suspect, 48-year-old William E. Creighton, and a passenger were taken to a hospital by ambulance, and the extent of their injuries was unknown according to Halverson. The driver of the second car was taken to a hospital by a family member to "get checked out," Halverson said. Upon being released from the hospital, Creighton was lodged at Clackamas County Jail on charges of third degree assault-DUI, DUII, reckless driving and reckless endangering. Salamo Road was closed between 10th Street and Green Street for about an hour after the crash.